Hello! Bonjour! Hi! Salut! It is 2019 and we’re doing a bit of reflecting on our first study tour. As is tradition, the interns travelled to Ottawa to visit Parliament Hill. Centre Block, including the House of Commons and Senate Chambers, are being closed down in early 2019 to do renovations for a decade. So our cohort of OLIP interns were one of the last tours to see the Chamber in it’s original glory. 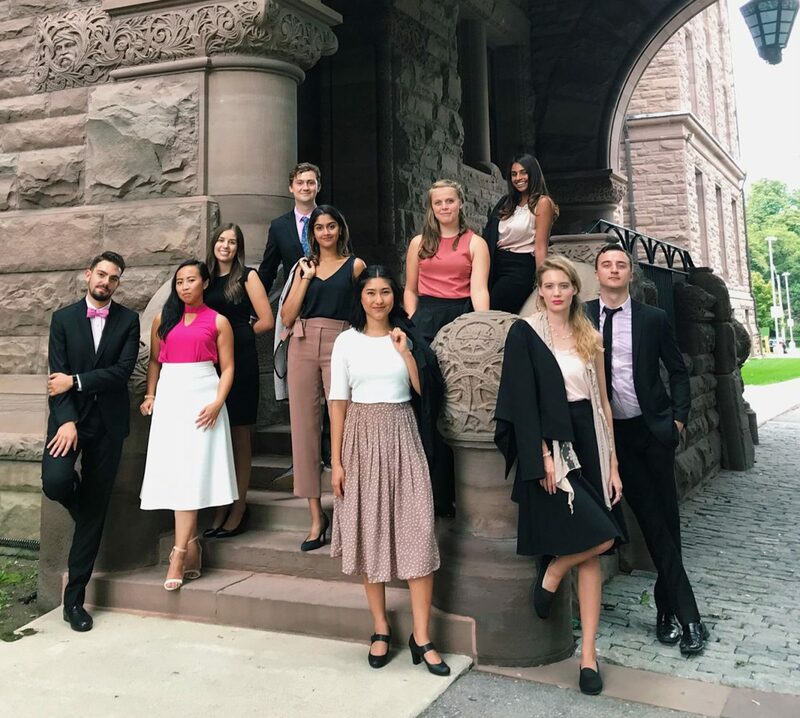 Before we go through a summary of our trip to Ottawa, we have to give an enormous thank you to our sister programme – the Parliamentary Internship Programme (PIP) who showed true Canadian hospitality during our visit. We started our day with several cups of coffee and a 6:40am train ticket to Ottawa. Thank you so much to our sponsor VIA Rail for getting us to and from Ottawa safely and reliably during our visit. Our first stop was a quick tour of Centre Block with PIPs Andrew and Sarah. We then headed into the Speaker’s gallery to watch our first federal Question Period! Identical to the Westminster tradition, on Wednesdays, the Prime Minister answers all of the questions in the Chamber that afternoon. There are some notable differences between Queen’s Park and Parliament’s Question Period (aside from the fact that Parliament has approximately three times as many elected members). For example, the current government has decided that they will not collectively produce standing ovations for members, and that there is more French spoken and highlighted in the House. Afterwards, we met Liberal MP, Nathaniel Erskine-Smith the representative of Beaches-East York. He had some fantastic insights about how rewarding and challenging politics can be. To finish our evening, the PIPs hosted a welcome pub night and then we watched the inaugural light show at Parliament Hill. Luckily, we had the opportunity to sit down with two current members of cabinet. The Honourable Bill Blair provided sage advice from his successful career as Toronto’s Chief of Police to now Minister of Border Security and Crime Prevention. He discussed how his previous experiences in policing and community engagement had prepared him for success in his current role. Honourable Bardish Chagger is currently the first female ever to be appointed Government House Leader. Throughout our visit, she was bubbling with pride and excitement about her role as an MP. Progressive Conservative MP, Erin O’Toole, Liberal MP, Adam Vaughn and New Democrat, MP, Scott Duvall shared how they leverage their past experiences, policy passions, and tools as a backbench MP to push forward on issues that manage to them and their communities. MP for Spadina-Fort York, Adam Vaughn shared his passion and motivation to build better cities for communities. Every MP has a different style when they approach politics, Mr. Vaughn’s is unrelentingly driven in his philosophy that cities are at the heart of every healthy nation. Taking a break from our elected official visits, we had the opportunity to meet with long – serving public servant, Daniel Watson. He recently moved from his role as CEO of Parks Canada to become the Deputy Minister of Crown-Indigenous Relations and Northern Affairs. He enthusiastically told stories about his career working in various provinces and federally. One of the highlights was explanation of the key role that the federal government plays in the day-to-day lives of Canadians. Our last formal meeting of the day, was meeting the Speaker of the House of Commons, the Honourable Geoff Regan. Having watched Question Period on Wednesday, we know that it can be a difficult job to maintain order during proceedings, but his calm and fair demeanour makes him a great candidate for the job. We finished our day with “Blood and Guts” tour of Parliament Hill. From exploring the basement of Centre Block where there is an old-fashioned Coca-Cola machine to hearing the histories of some scandalous royals – we saw Parliament Hill in a whole new light! Afterwards, we hosted our Alumni meet up and spent the evening getting to know some of our amazing OLIP veterans! Our last day in Ottawa was bitter sweet with some fantastic meeting to wrap up. We started our day with the British High Commission before heading to meet Senator Kim Pate. The rest of our morning was divided between Danielle White, the Director General of Sectoral Policy at Indigenous Services Canada, provided some fantastic insight about the tools that all Canadians can use when having conversations around Truth and Reconciliation. We met with accomplished journalist and reporter, Amanda Connolly who currently works at Global News as a National Online Journalist. She honestly answered our questions about the quick changes happening in journalist writing and where she thinks it will take us in the future. We also met Senator Peter Beahm, who shared anecdotes of his illustrious career in the foreign and public service. We agreed that if we had the chance, we could have spoken with Mr. Beahm for hours, digging deeper and deeper into his accomplishments and experiences. The rest of our day was spent at the Supreme Court of Canada. We met Justice Andromache Karakatsanis who explained the importance of the judicial system in Canada and the highlights of being a Judge in the highest court in Canada. Afterwards we got a “behind the scenes” tour of the Judges’ area, library and Supreme Court building before heading to our final event – a meet and greet with our generous sponsor the Canadian Political Science Association (CPSA) and the PIPs. We also want to take this opportunity to wish everyone a happy holiday seasons and a safe beginning to 2019.